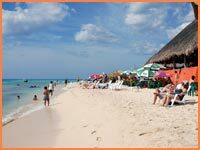 Check out the island's many miles of beautiful white sand beaches and our variety of Cozumel beach tours and packages. From larger theme park style beach clubs, to smaller local beaches with fishing boats, everyone is guaranteed somewhere to enjoy the day. Couples and others looking for a more adult-oriented beach will love this all-inclusive resort. Find jungle gardens, pools, a wonderful large white sand beach, and far fewer children than most resorts, this is the ideal location to relax and let the world go by. Aimed at the adult market, this high-end resort is located just a short taxi ride from downtown and the cruise ship piers. Fantastic all-inclusive getaway on a private island for an unforgettable day away the usual tourist traps. 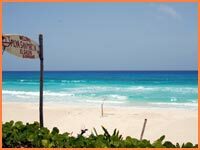 Stroll along the white sand, go shopping, get a massage, take a swim, paddle a boat, or simply sip a cold margarita. Get there by Land and Ferry, Boat, Jet Boat, Jeep, or in your own vehicle. All tour options offer 3 hours on the island with all-inclusive lunch and open bar. 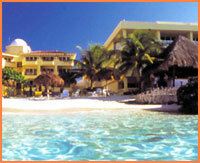 Cozumel beach resort offering everything you could possibly want for an unforgettable day of sand, sea and sun. Great for families, this unbeatable package includes full use of the resort, pools and water park, as well as towels, snorkel gear*, open bar and all-you-can-eat buffet. Located just a short taxi ride from downtown and the cruise ship piers, the beach offers clean, comfortable lounge chairs, a large white sand beach and three pools. Enjoy crystal clear protected Marine Park waters and reef for snorkeling or diving. A large white sand beach area with bars and restaurants. Mayan culture and history, tequila tasting, fresh hand-made tortillas and an incredible lagoon. All that just for starters. We recommend booking a package deal to save you time and money on the day. This exclusive beach club is near downtown and the cruise ship terminals. 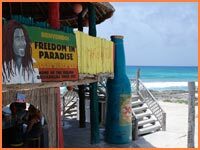 It offers a bar, restaurant and activities that include snorkeling and resort diving. You won't find a better value, stylish beach in the Caribbean than this - on the beautiful coast of Cozumel, by the Marine Park and reefs. Small bar and restaurant on the beach a little off the beaten-track. It's located on the old coast road which is only accessible by vehicles in one direction now (driving south). This means it tend to attract less visitors, even though the snorkeling can be fantastic. Good shore snorkeling at nearby reef. Day packages available. Recently rebuilt, family fun beach. Soft white sand entry into the water, swimming pool and bar. 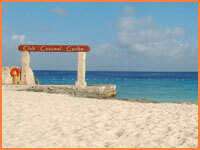 There are two other Cozumel beaches next door too. Small, white sand hotel beach with free entrance. 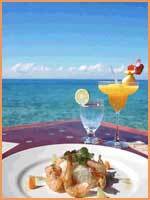 Bar and restaurant with excellent menu - a favorite amongst Cozumel beaches. 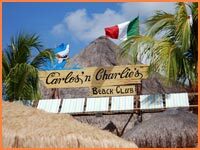 Cozumel's premier beach park! Come visit this innovative attraction, your vacation will never be the same. Have a blast with family and friends at Playa Mia Grand Beach and Water Park. Cozumel beach bar and restaurant with rustic palapa thatch roof. Fantastic grill with fresh seafood straight from the fishing boats on the beach. 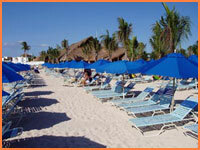 One of the quieter white sand Cozumel beaches with great local atmosphere. Boat-trips to snorkel the island's nearby southern reefs. Stunning white sand beach with reef for drift snorkeling and crystal clear water. 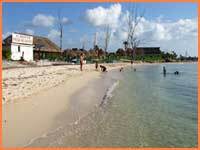 This Cozumel beach is part of Punta Sur ecological reserve. Long stretch of wild, unspoilt white sand beach with a restaurant and bar. Stunning views across the Caribbean on the windward east side of the island. 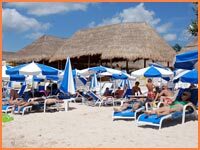 A family run beach club on Cozumel's beautiful north coast at Playa San Juan. Pool, white sand, snorkeling and all the facilities you'd expect for a great day in the Caribbean.